An education which denies the voices of youth can never benefit from their wisdom as to how to restructure it. In many of the educational and teacher training programs I have been a part of, I’ve been frustrated by the intense focus given to preparing students for their academic futures (meaning standardized testing and ultimately college) while virtually none has been placed on creativity, question asking and critical thought. Indeed, if I were to take the training I had received from these programs at face value, I would understand my only duties as a teacher to be familiarizing myself with the state’s set curriculum, leading my students through each part of it in increments, and then assuring that they could correctly recall all the information therein when required to do so. In these same programs, when have I asked where students’ voices and ideas came into the curriculum, where their ability to process their own experiences and shape their own learning environment could take place, I was told there wasn’t time. There was an achievement gap to close, and our students were behind. We needed to prepare them to test well, enter into good schools, and succeed at the same levels as their wealthy, white counterparts. And besides, once they had cleared all the necessary hurtles, they would go on to college where they could engage in big picture, critical thinking. Our job was to get them there. On the first day of school this past year, the sixth grade teacher in whose classroom I am interning sat all his students down in a circle to discuss what the goals of the year were going to be. “I don’t want anyone to ask me what they are going to need to know for seventh grade, or what they are going to need to know for high school,” he said. “My job is not to prepare you for seventh grade. My job is to help you be the best sixth graders you can be.” He went on to describe all the ways in which he hoped to build a community within his classroom, and that more than grades, more than achievement, creating a space which incorporated and supported everyone in their own learning processes was the students’ primary charge. The statement struck me as powerful at the time, but it wasn’t until very recently that I began to understand how radical it was. For imagining learning as something which is about empowering our communities in the present, not preparing individuals for the future, counters the swing of current reforms, acknowledges that critical thought should be a part of any education, and values the needs, ideas and voices of youth in the process. In the past week alone, I have supported students as they’ve faced deportation, domestic violence, and poverty. I’ve watched them struggle with body image, racism, and drug addiction in their families. Posing questions to them over the course of my time as an intern, I have been floored on countless occasions by their insights on gender, class, language, culture, and the educational system itself. Yet in much of my training, when I have inquired as to how we as educators can not only support students as they wrestle with these systems, but engage their insights as a means of challenging them, I have been told that youth are not ready to grapple with such heavy issues. As a young educator, but also as a young person, it perplexes me that such astronomical expectations are placed on children outside of the classroom–namely, that they single-handedly navigate the world of injustice and inequity that we have created for them–yet they are coddled and belittled in spaces dedicated to learning. Why do we think students who live in public housing are not ready to talk about class? Why do we believe students who are already working multiple jobs are not mature enough to discuss global economy, and the redistribution of its resources? When we pretend that children are just adults in hatching, waiting to become real participants in the world, we don’t merely take away their agency and lose out on their wisdom; we deny that they are already full participants in the world, on the front lines of the most critical struggles in modern history. Moreover, we rob them of global legacies of radical activism and community organizing which have been catalyzed and led by youth, with adults following their example. Traditional education is a hierarchy, and like all such systems, it is often those placed at the bottom who have the most knowledge of how that structure denies justice, and the most insights into what is to be done to change it. A radical education seeks to give youth a real voice, the ability to critique the systems of which they are a part, and the space to teach their communities what they already know of the world, and what visions they have to bring justice to it. 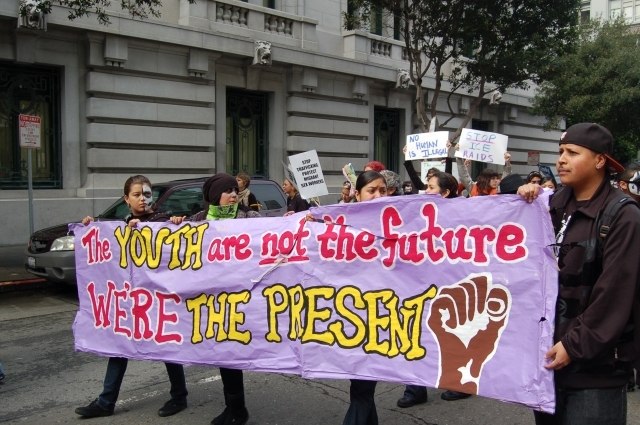 It imagines youth as fully-realized global citizens, and as the present–not just the future–of our struggles for equity, peace and liberation. I love the picture that accompanies this post and even more, love the perspectives you are blogging from. I’m so glad you have chosen to be a part of this community. Schools need to stop insisting that kids know less than they know, that kids can do less then they can do, and that kids can only learn certain things at certain times. Protecting learning experiences like the one you describe – and those you facilitate with your questions – should be our leadership’s sole concern right now. Can we invite our supervisors into these classes and conversations and draw strength together with students to be more honest, just, and relevant? Smack dab in the middle of ChiangmaiUniversity is a pot of gold in terms of talented teenagers. These teenagers study at the Chiangmai Demonstration School only a stone throw away from the Chiangmai University Faculty of Education. The school has 1,356 students , 80 teachers and 30 teacher assistants. Every year approximately 3,500 students take the entrance exam to be admitted to the Chiangmai Demonstration School ;only 240 are admitted. Those who attend this highly selective school , therefore, are the crème de la crème of the Northern Thai youth gifted brain pool.